This article is reprinted from The Lewis County Catholic Times, the weekly bulletin of Saint Patrick Catholic Church in Weston, West Virginia. As some of the liturgically adept may know, most years we celebrate the external Solemnity of the Epiphany of the Lord near the beginning of January. The term "external solemnity" refers to the fact that for the sake of convenience in this country, the Solemnity is transferred from its actual date of January 6 — 12 days after Christmas — to the nearest convenient Sunday. On this Solemnity, we commemorate the day on which the Magi encounter the newborn Lord and pay Him homage. Traditionally, Christmas was celebrated on this day, because it was marked by the giving of gifts, and beacuse it commemorates the reveleation of God's Son, our Newborn King, to the world. 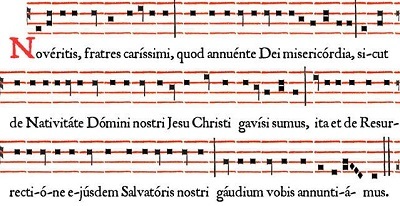 It is also the last major festival of Our Lord prior to the Paschal Triduum, the Baptism of the Lord being of a lower rank as a liturgical feast. Epiphany has lost some of its luster in the last century as more and more focus has been placed on the commercialized Christmas. There are still some (including myself) who refuse to open gifts until January 6, however. Moreover, Epiphany is the back-drop for one of the most ancient practices of the Church: the Noveritis, that is, the Announcement of the Moveable Feasts of the New Year. This tradition dates back to the ancient Church at Alexandria, where many astronomers resided. They were given the honor and task every year of accurately calculating the date of Easter and the various feasts of the year which rely upon that date (Ash Wednesday, Good Friday, Pentecost, et al.). It was then their mission to communicate these dates to the rest of the Christian world through the Patriarchs of the East and the Pope at Rome. The Council of Nicaea (AD 325) is said to have formalized the practice, and consequently, that everyone, everywhere should celebrate it on one and the same day. Although there is no mention of the fixing of the date of Easter in the canons of the Council of Nicaea which have been preserved, we know that the issue was discussed and decided by the council with three texts: a letter of Emperor Constantine, a synodal letter to the Church of Alexandria, and a letter written by Saint Athanasius in 369 to bishops of Africa. In the fifth century, Cyril of Alexandria is said to have written in an Easter letter: "The Ecumenical Council voted unanimously that the Church of Alexandria, because of its illustrious astronomers, should report annually to the Church of Rome the date of Easter, and Rome would communicate to other churches." The Fourth Council of Orleans (AD 541) shows how this practice, already firmly established, had made its way to Catholic France. Following the Gospel on the Solemnity of the Epiphany, the congregation remains standing for the chanting of the ancient text which announces the dates of Ash Wednesday, Easter, Ascnesion, Pentecost, and the First Sunday of Advent for the new year.